Saturday December 23rd 1893 Mother came over this morning and I went up town with her to get a few things for Christmas. I was at home in the afternoon. Hattie was here a moment. Will spent the forenoon looking over the Hedges farm and was late to his dinner. I went up town just before supper. Spent the evening at home. Sunday December 24th 1893 I went to church and Will went over to Woolfs. I went over home from church. They had the Bremner family there for dinner. Will stopped for me and we had a pleasant walk home. We talked till time to go to church. Mr Edwards spent a little time with us. 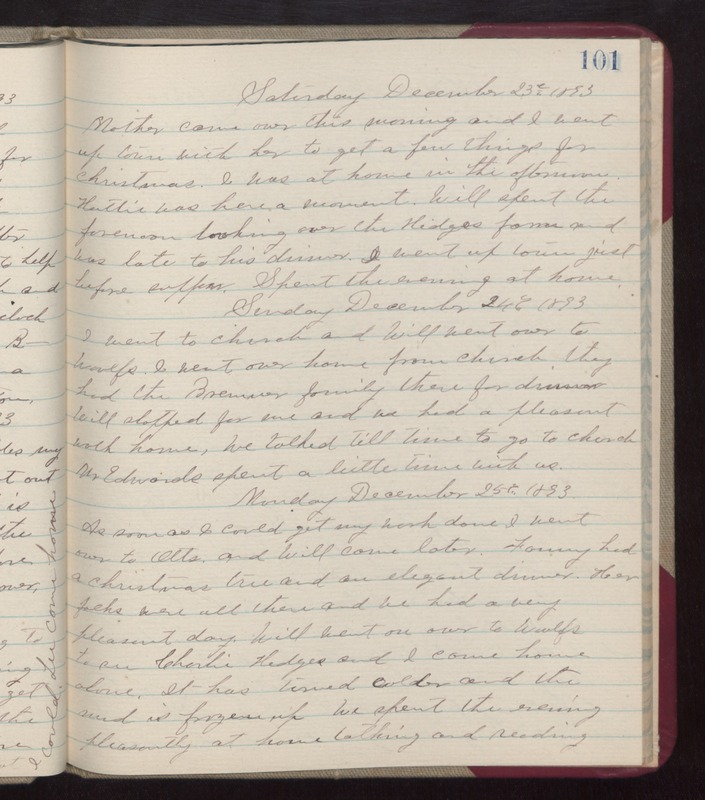 Monday December 25th 1893 As soon as I could get my work done I went over to Otts and Will came later. Fanny had a Christmas tree and an elegant dinner. Her folks were all there and we had a very pleasant day. Will went on over to Woolfs to see Charlie Hedges and I came home alone. It has turned colder and the mud is frozen up. We spent the evening pleasantly at home talking and reading.